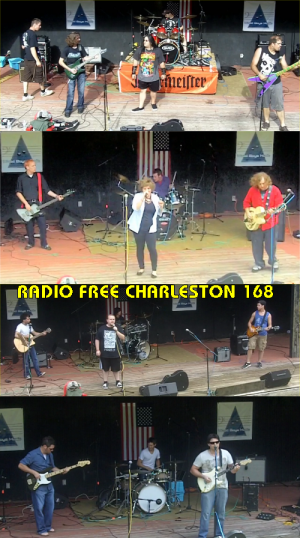 This week we go back to September, 2012 for the final of our three “Tribute The To The Troops II” episodes of Radio Free Charleston. This wraps up our three-part special devoted to Tribute To The Troops II, an all-ages, all-day musical event held at The Saint Albans City Park amphitheater for the benefit of The West Virginia National Guard Foundation and The Wounded Warrior Project. This episode brings you music from In The Company of Wolves, Point of Jerus, Deck of Fools and a very special song from HarraH. We also have a short film about The West Virginia National Guard Foundation narrated by Melanie Larch, with video contributions by Steven Allen Adams and West Virginia Public Broadcasting. I want to take a moment to thank Dave McClanahan for his audio superheroics on these three episodes of the show. Dave is a friend, a technical genius and an incredible musician going all the way back to the original radio incarnation of Radio Free Charleston. Dave’s band project, The Mad Scientist Club, was one of the most-requested groups on the radio show, and we’re glad to bring you some of their tunes on the new RFC radio show on The AIR. It was a surprise and a treat to discover that Dave was recording Tribute To The Troops II and I can’t thank him enough for the high-quality board recordings and the ultra-deluxe twenty-track mixes for In The Company of Wolves and Deck of Fools that he was able to fit into his busy schedule. Playing us out we have our old friends, HarraH, also returning from episode 166, performing a special song written by Dawn Marie Wood. “Too Late” came from the pen and the heart of the lady who conceived Tribute To The Troops, and with her husband, Brad and Wood Boys Music, they helped to pump a lot of life and excitement into the local music scene. These last three shows would not have been possible without them. This is a bit of a bittersweet show to look at now, because due to my health, it’s unlikely I’ll ever record video at another outdoor event. It was a real kick to put these together, and I hope you’ve enjoyed watching them again.